Note: Since originally publishing this recipe, we’ve received a letter from a reader who is concerned plastics which aren’t specified as food-safe are being used to serve it. This is certainly the kind of thing that is very easy to avoid, so if you have concerns after reading her letter, you can simply line the garbage bag with plastic wrap and substitute a standard serving utensil for the cat litter scoop. Thank you for your suggestion, S.W.! Litterbox Cake is a moist, tasty medley of cake and instant pudding accented with green cookie crumbs and chocolate candy “turds”. It’s especially appropriate for a cat-lover’s wedding or birthday, but really it’s hard to think of an occasion when a Litterbox Cake wouldn’t hit the spot. “My name is Anna Vigliotti, and I am the creator of the kitty litter cake. In the early 90’s I was asked by two friends of mine who breed cats to make a cake for an upcoming regional cat show in the Minneapolis/St.Paul area. I came up with the idea of making a cake that looked like a used litter box, feces and all, and put it into a new litterbox. My friends took it to the cat show, where it was a big hit. I never made another one. Just a few months ago a neighbor remarked in passing that she had just seen her first kitty litter cake. I was aghast! I hit the internet and could not believe what I was seeing. It was my cake–made the same way! What a strange feeling. The recipe has changed a little–I have a feeling that the spice cake option came from Gerry Denson–the friend for whom I made the cake. He was very partial to spice cake. It was his idea to serve it with a litter scoop. I’m not sure whether I should be proud or ashamed!! If you don’t wish to purchase a litter box and liners, you can substitute a similarly sized cardboard box and plastic garbage bag. An unused emesis basin, often handed out during hospital trips, also makes a good substitute litter box. If you’re not familiar with the appearance of kitty litter or kitty feces, do some research. We wished we had after grinding up our first batch of cookie crumbs to the consistency of flour, which was totally unconvincing as kitty litter. Can you imagine what a faux pas this would have been if we’d wished to serve the cake at a party or a wedding? Prepare cake mixes and bake according to directions. Use any size pans you like. Once the cakes have cooled, crumble them into a large bowl. Prepare pudding mix and chill. Using a blender, crumble the sandwich cookies. If you don’t have a blender, place the cookies inside a plastic bag and smash them on a hard surface. Set aside all but 1/4 cup of the crumbs. Add a few drops of green food coloring to the 1/4 cup of cookie crumbs. Mix using a fork or shake in a jar until the food coloring is uniformly distributed. Toss the cake crumbs with half of the white cookie crumbs. Add enough of the chilled pudding to moisten the mixture; you probably won’t need to use all of it. Place a new liner in the new cat box. (This is not a time to cheap out on used goods!) 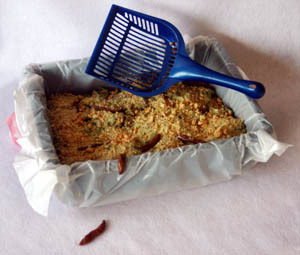 Distribute the cake mixture evenly in the litter box. Repeat with 3 more Tootsie Rolls. Bury the Tootsie Rolls in the cake mixture. Sprinkle most of the remaining white cookie crumbs over the mixture, then scatter the green crumbs over the top. 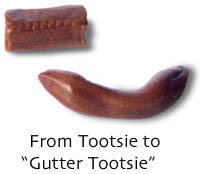 Heat the remaining Tootsie Rolls, three at a time, until almost melted. Scrape them off on top of the cake and sprinkle with cookie crumbs. You may also wish to artistically drape one or more Tootsie Rolls over the side of the box, sprinkling it lightly with cookie crumbs. Place the box on a newspaper. Serve with a new litter sifter. Serves one teenager, 5-6 inebriated adults, or zero sober adults. Also, I believe it was on Aileens Crafts, but they had a segment showing this cake on TV. I remember because I thought it was going to be a normal cake show, and this normal mom looking lady comes out, and made this creation. I was completely horrified and disgusted because as a kid I really didn’t see what was so hilarious about making a perfectly good cake turn into something so gross looking! Sorry Anna Vigliotti, you were NOT the first to make one! I have seen them as far back as the 60’s and 70’s when I was a kid! !